Plans in place, ready to roll!!!! Life has a way of changing our carefully made plans! We had expected to travel south to Florida in March and unexpected ice/snow and other things kept us home bound in New England. So finally, after what seems like a very long time, we are ready to ramble!!!! 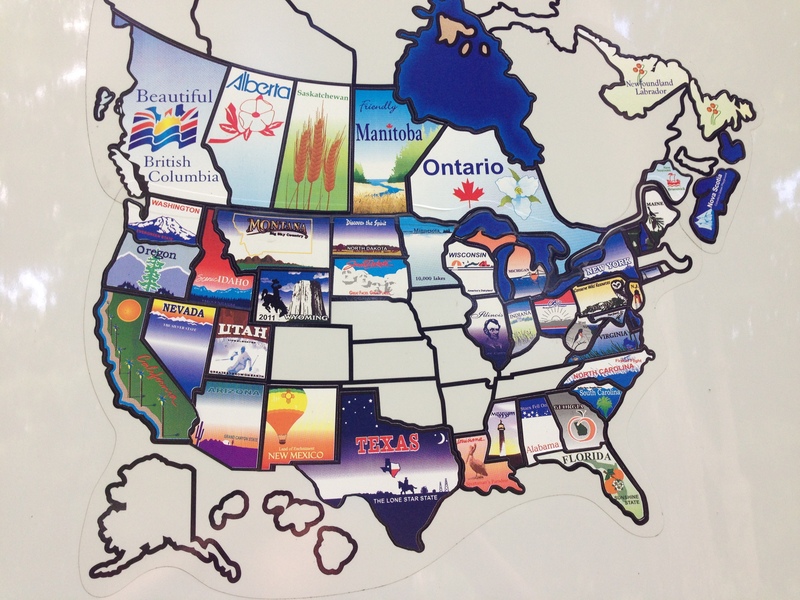 Here is a look at where our previous two years of travel have taken us! Our map from previous camper. Now we are putting a blank map on the new Winnie, and will have to start all over again! Tough job, but someone needs to do it. We expect to leave on our Great Alaskan Road Trip on May 17th, and will take our time and enjoy the journey over the next few months. We have studied maps, weather, and road reports; and are currently wrapping up all the mundane details that need to be taken care of when you are on the road for an extended time. Minor details like mail, canceling cable and internet, cleaning out the fridge, vehicle registrations, property taxes, and the like! We are excited to be towing our Jeep this trip! The Blue Ox tow bar and the Patriot braking system have been installed and tested. We have actually practiced hooking, towing, and unhooking the Jeep Wrangler. Charlie has built a bicycle carrier in the back storage area, has a solar suitcase to supplement battery power while boondocking off the grid, and has the rig in tip top condition. 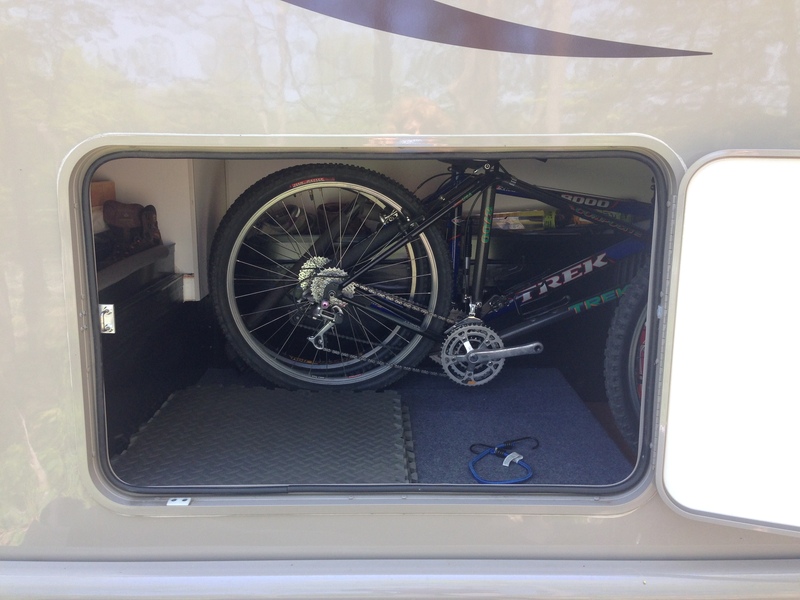 Looking at the bicycle compartment from the back of the camper. We really are ready to ramble!!! This entry was posted in Alaskan Road Trip, Rving on May 15, 2015 by Ramblin' Rose. Can’t wait to follow you guys, if you head to the southwest let us know so we can meet. Happy trails to you, others that have made your trip have mentioned watching out for moose and the flying pebbles.. Thanks, Rocky! We may travel south on our way home, and will be sure to look you and Caroline up. is there room for me next to the bike rack? Enjoy !!! I will keep tabs on our hill and let you know if anything exciting happens (not likely). Look forward to reading your blog and viewing the great photos. Thank you, Diane! We will miss being on the hill this summer, but are looking forward to the Fall. 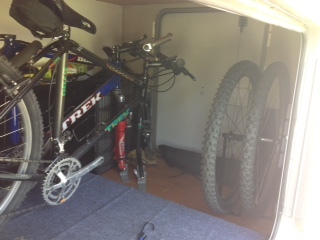 Charlie made a nice bike rack…safe travels and enjoy the ride! Thanks, Wendy. Hope you fire up your camper soon and join us! Thank you Celeste! Maybe we will see you and Don on the road. Sara, we know exactly where you are. Andy’s cousin, who lives in Chicago, hosted a family reunion at their home in the Dunes a few years back. Great spot! I’m posting under this entry because there is a problem with the link for your most recent post. I can’t get to the post of comments on the blog but can see it in email. You might want to check it. Happy travels! Bonnie, I think I caused the problem with a last minute edit, hope comments are back to working now. It is so peaceful here in the Dunes, very few other people camping mid week. Hard to believe it is so close to Chicago!